Accidents involving Automobiles, Bicycles, Pedestrians and Motorcycles. Did you injure your wrist, knee, elbow, arm or foot in a car crash? Bracing against the steering wheel, steering column, dash board, door or floor board can cause serious wrist injuries, ankle injuries, or knee injuries resulting from the impact of a car crash or truck accident — especially in rear-end, head-on or side-impact (sometimes called a “t-bone”) collisions.Individuals injured in motor vehicle accidents have legal rights and deserve to be compensated for injuries. 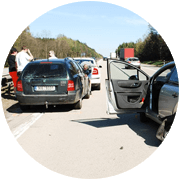 Our Los Angeles car accident attorney has extensive experience in these cases. Our consultations are free and will provide useful and accurate information. Clients are not charged attorney fees unless the case is resolved successfully. Legal representation is provided for individuals injured in accidents occurring in the California area. A fracture or joint injury can cause immediate damage and pain. There are long-term effects that need to be accounted for, especially when you have been injured due to negligence. Car accident attorney in Los Angeles, David Makkabi, founded Makkabi Law and has an outstanding record of providing excellent representation to his clients. His experience in personal injury cases enables him to handle situations including catastrophic injuries such as lacerations, tissue damage, serious spinal surgeries and life-altering brain surgeries. Expert witnesses such as medical specialists help Mr. Makkabi to create strong cases that will provide proper compensation for the injuries of clients. David Makkabi, Los Angeles car accident lawyer, founded his law firm with the goal of getting his clients the best results in their personal injury cases. He provides his expertise, high standards and professionalism to every client. He also ensures that each client will receive his personal attention in every claim he handles.Aggressive representation is assured to those who are seeking a car accident lawyer in Los Angeles, but our commitment does not stop there. We also assist clients in making proper medical care choices and in finding insurance to cover all of their needs. Our car accident attorney in Los Angeles has the experience needed to represent clients with personal injury claims. Call 310-887-8000 for a free consultation with an experienced car accident attorney in Los Angeles and to receive what you deserve for the injuries you have suffered.